Join Lily's the day after Valentines Day as we help you find that true lasting love ... in the form of cat or kitten. True love doesn’t have to be hard to find; it’s all about where you look! Join Lily’s Bistro as they host SICSA Pet Adoption Center and their furry feline friends for the ‘Lonely Hearts Club’ on Tuesday, February 12 from 5-9pm. 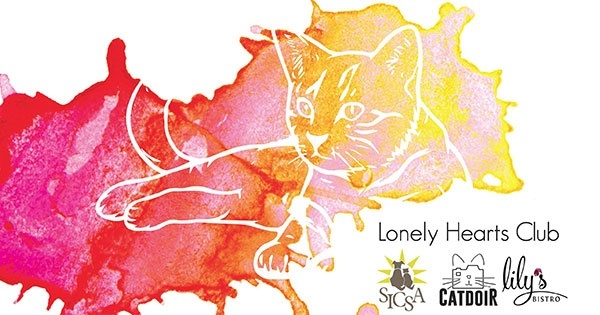 For the Lonely Hearts Club, from 5-7pm SICSA will have a number of adoptable cats on hand for you to socialize with and even schedule a later appointment to discuss adoption. For those interested in the Lonely Hearts Club, the event takes place on Tuesday, February 12 from 5-9pm at Lily’s Bistro. SICSA will be on site with cats to meet, the kitchen and bar will have specials for the night, and a portion of the evening's sales will be donated to SICSA. Find more events like "Lily’s Bistro Host Lonely Hearts Club in Benefit of SICSA"